Zambian Economist: Oil in Tanganyika? 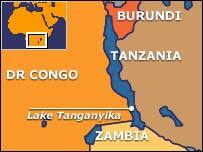 The DRC plans to open 10 blocks on Lake Tanganyika for oil exploration following interest from foreign energy firms. The DRC oil sector has been virtually paralysed since the 1970s. The bidding process for the blocs will begin in April. In the words of the DRC official : "We know Lake Tanganyika has lots of petrol because it is the only one we've got lots of data for - seismic, magnetic - the geology has a lot of potential....We have to give these (blocks) to a big company because Lake Tanganyika is so deep, at 1,500 metres. It will need a lot of work". Admittedly, the larger part is in DRC and Tanzania but I have not heard anyone even remotely suggest that the Zambian end may have oil.